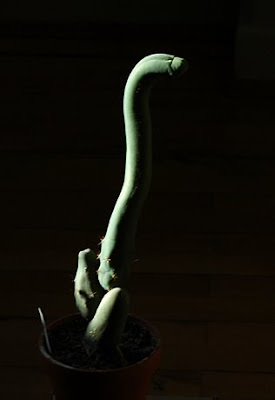 I recently got in contact with the German artist Klaus Weber who works with cacti (among other things) in an artistic context. 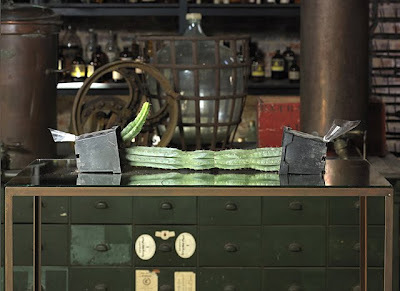 Klaus would like to exhibit a Double Cactus in New York, i.e. 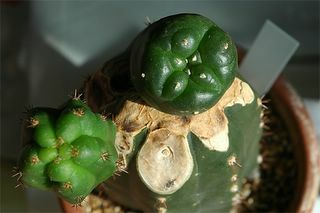 a piece consisting of two San Pedro (Trichocereus pachanoi) plants grafted together to form one, mirrored plant similar to the ones pictured in this post. 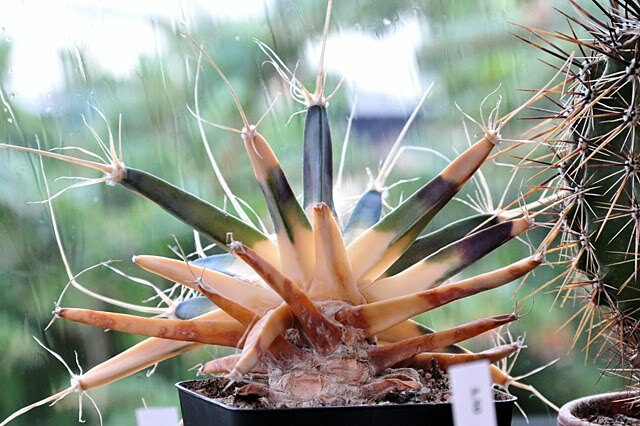 Unfortunately Klaus has encountered problems with bringing the plant(s) into the US from Germany and consequently he is looking for a US resident who can help him recreate the grafted cactus piece “in situ”. 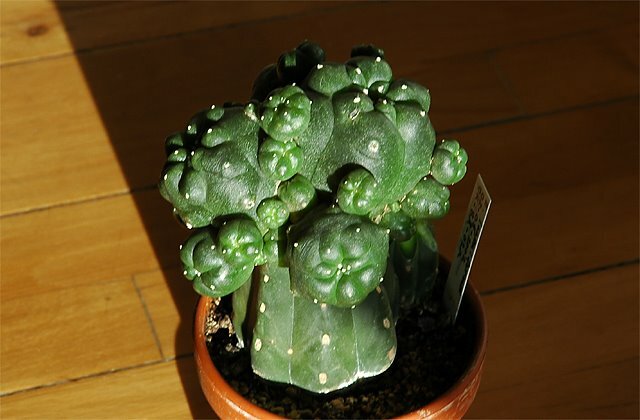 If you (or anybody you know) are a skilled grafter with the inclination to collaborate with Klaus on creating a Double Cactus in the states, please get in touch with me. 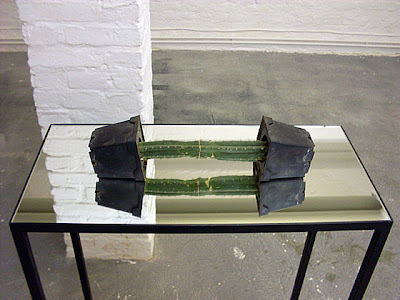 I'm especially infatuated with the last picture – the cacti that sort of grow into each other, reflected in the mirror they sit on, go perfectly with the pillar that transcends smoothly from the “actual” world into the reality behind the looking glass. 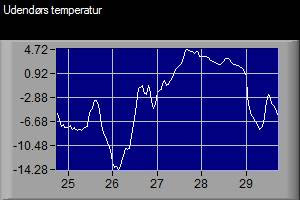 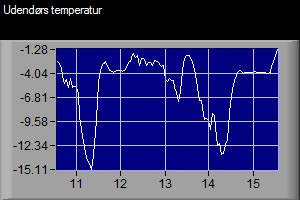 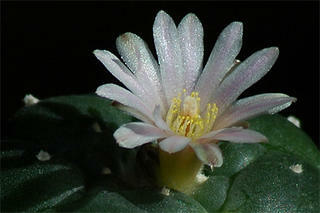 The pictures are used with the kind permission of Klaus Weber. 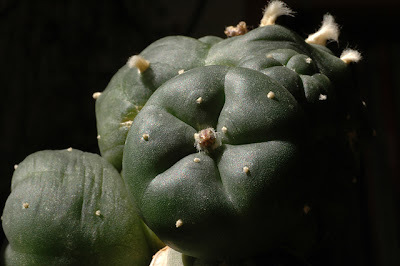 June 7 my grafted Lophophora williamsii v. caespitosa plant could celebrate its 4th anniversary on top of its Trichocereus bridgesii stock. After four years the main head has grown to a width of 6 cm (~2.4'') and the scion is more than 14 cm (>5.5'') wide in total. Unfortunately the plant was maimed by spider mites last year. 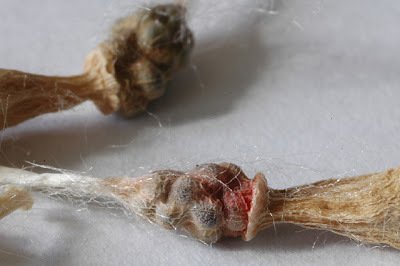 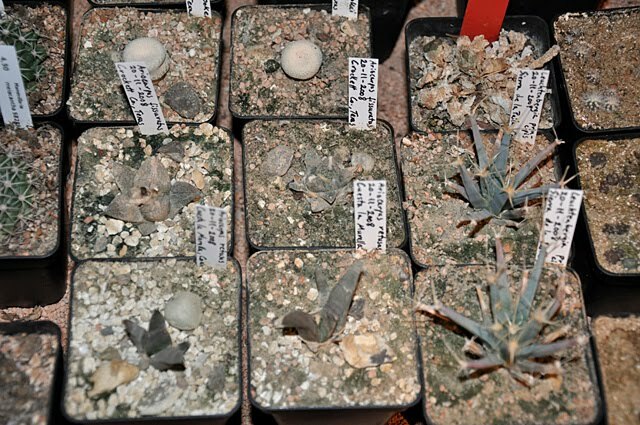 I didn't check my plants for mites before leaving them unattended for several weeks during my summer holiday. 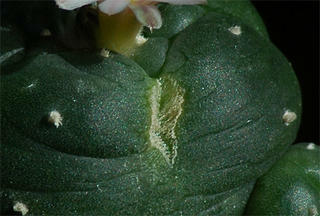 When I returned the damage was done and much of the plant ended up severely scarred. 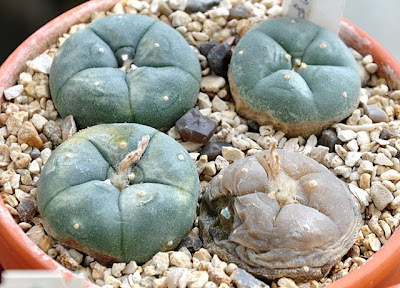 Fortunately the spider mites stayed off most of my other plants, and the scarred epidermis of the grafted Lophophora williamsii v. caespitosa will soon be replaced by new growth. 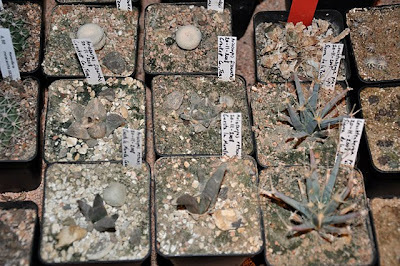 To avoid spider mites I'm now showering my plants as often as the weather and my patience permit ;-) Any remaining mites are sprayed with isopropyl alcohol on sight. 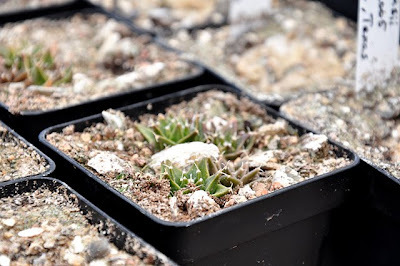 So far this treatment has kept my plants safe from mites, but the big test will be the coming hot summer months where the plants are left on their own to a great extent. 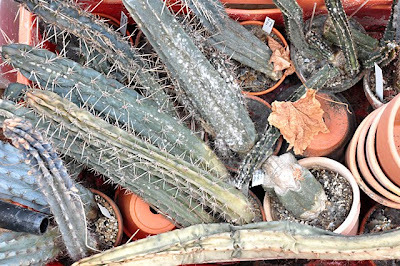 As always I’m fascinated with the explosive growth induced by the Trichocereus stock – for comparison you can check the posts on the same plant one, two, and three years ago. 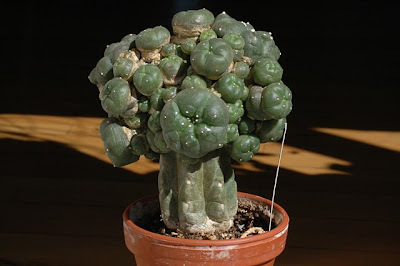 I’ve been pretty busy lately and completely forgot to post on the 3rd anniversary (June 7) of my Lophophora williamsii v. caespitosa graft. 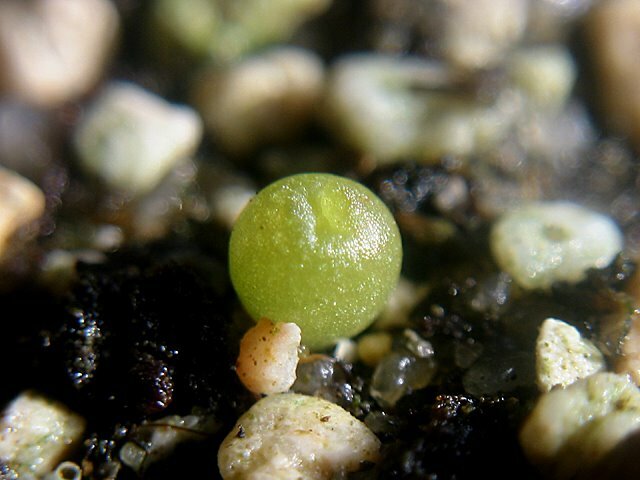 The main head is 5.5 cm (~2.2'') wide and the total width of the scion has increased to approximately 13 cm (~5.1''). 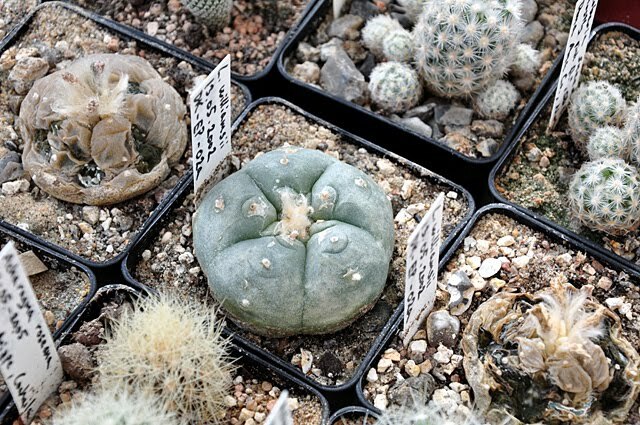 The Lophophora williamsii v. caespitosa scion is grafted on a Trichocereus bridgesii stock and was repotted early this spring (hence the supporting props). 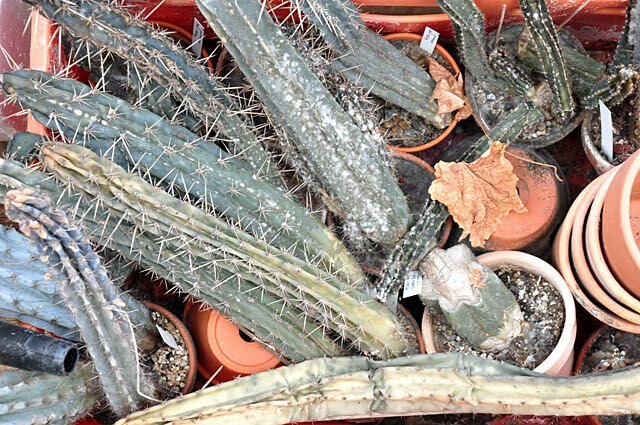 I’m fascinated by the explosive growth induced by the Trichocereus stock (for comparison you can check the posts on the same plant one and two years ago) but the appearance of the plant tends to become increasingly freakish. 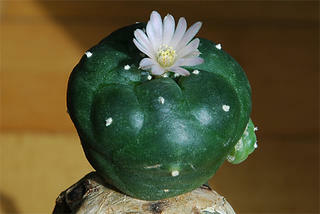 The plant doesn’t bloom with the same vigor as it grows – until now it’s only flowered once. Two years ago I grafted a 2 cm (~0.8'') wide Lophophora williamsii v. caespitosa cutting on a Trichocereus bridgesii stock. The main head has now grown to a width of 5.5 cm (~2.2'') and the total width of the scion exceeds 10.5 cm (~4.1'') – unfortunately the plant hasn’t flowered yet. 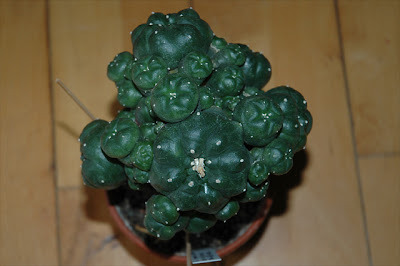 I’ve given up keeping count of the number of offshoots; the plant is virtually exploding with growth. 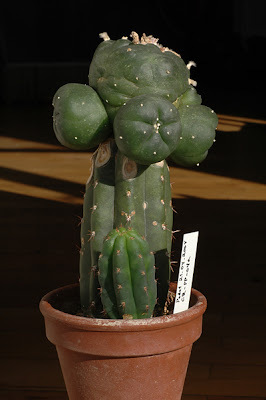 Trichocereus bridgesii is an exemplary stock plant; it’s long-lived, fast growing, not offsetting and almost spineless. 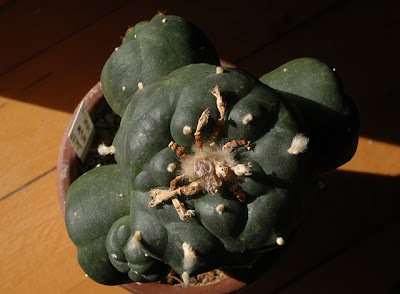 Last year I also posted a picture of the – then much smaller – Lophophora williamsii v. caespitosa graft. 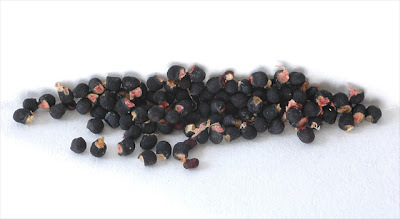 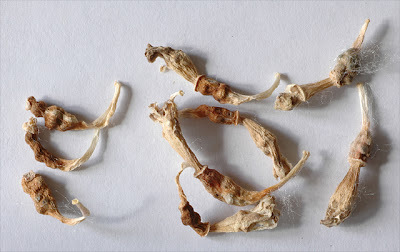 A photo of the flowering plant can be found in this post. According to Uhlig Kakteen the German name for this cultivar is ‘Frauenglück’, IMHO a more poetic description than the English moniker. 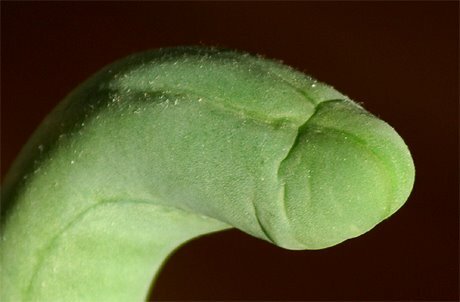 These days I maybe ought to have put a “Warning: Explicit Language” label on a post like this. 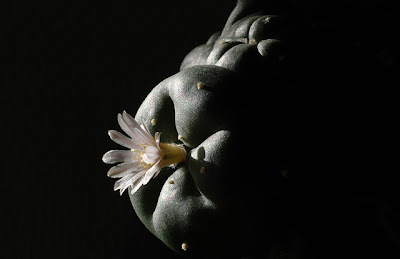 In less than one and a half years my grafted Lophophora williamsii (SB 854; Starr Co, Tx) has grown from a minute seedling to a mature plant, flowering for the first time. The Lophophora scion is 4.85 cm (~1.9’’) wide and has grown 3 offshoots; the flower is a typical pinkish white with a somewhat darker midstripe, and is 1.8 cm (~0.7’’) wide. 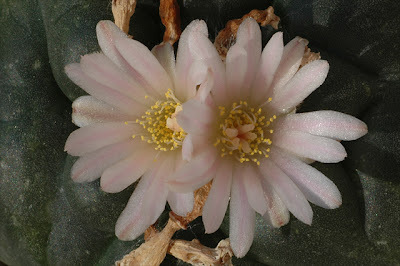 None of my other plants are currently blooming so I attempted to self-pollinate the flower. The Echinopsis (Trichocereus) pachanoi stock is striving to get a life of its own – since the previous post I’ve removed two offshoots. Even though it slows the growth of the Lophophora scion down a bit, I let the shoots grow for as long as they don’t intimidate the scion. The removed shoots are rooted and will be used for future grafts. 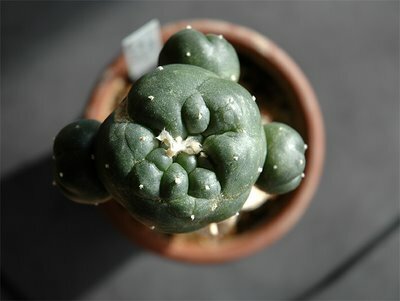 The main head of my grafted Lophophora williamsii v. caespitosa is now 4.5 cm (~1.77’’) wide – the total width of the scion is 7.3 cm (~2.87’’). 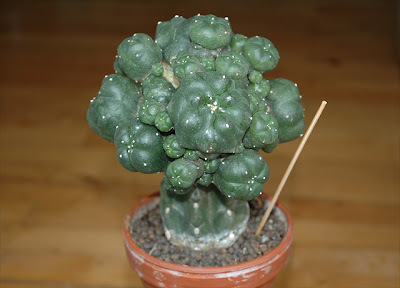 The plant was grafted one year ago as a 2 cm (~0.78’’) wide cutting taken from the plant shown in my profile photo. 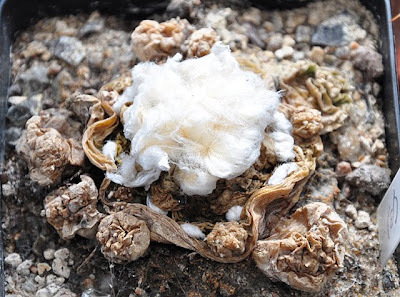 Unfortunately the mother plant caught rot in the wound and withered during winter. 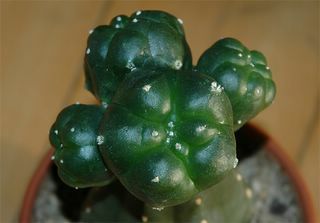 The scion is grafted on a Trichocereus bridgesii (Echinopsis lageniformis) stock. 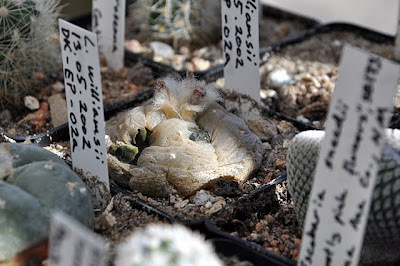 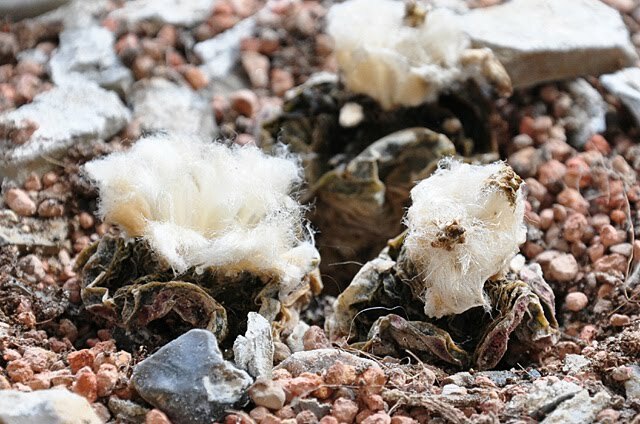 Follow this link to see the state of the Lophophora williamsii v. caespitosa graft one year later. 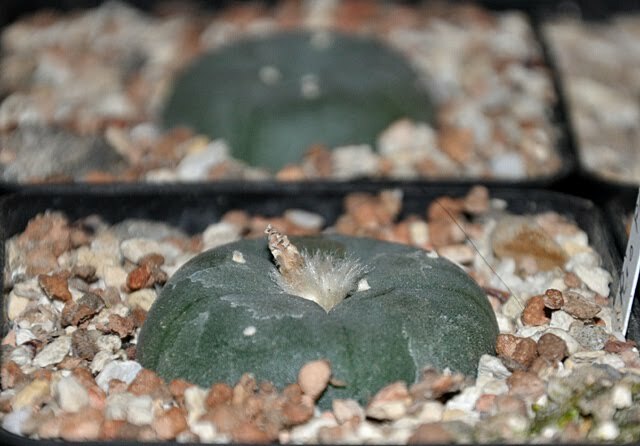 One year ago today, I grafted a 50some days old Lophophora williamsii seedling on a well established Trichocereus pachanoi stock. The Lophophora scion has now grown to a height of 3.3 cm (~1.3’’) and a width of 3.2 cm (~1.25’’). The barrel shape is not very becoming to the Lophophora, but hopefully it will flower soon. 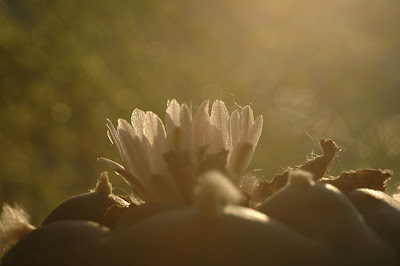 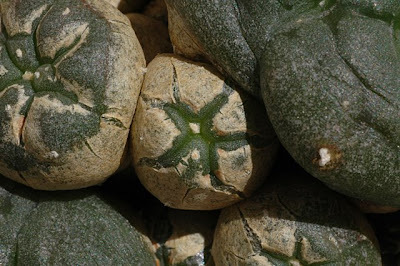 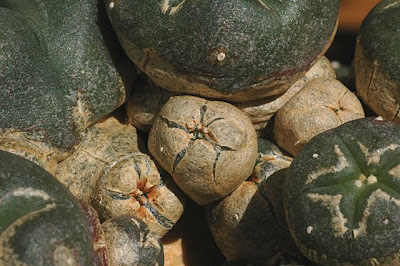 The grafted Lophophora’s siblings (all sowed February 29, 2004) still growing on their own roots are all less than 1 cm (~0.4’’) in both height and width.